"Do you know how to shoot straight?" While some people might take offense at such a question, it is one that big game hunters need to ask themselves every year. Shooting an animal with a high-powered rifle, no matter the distance, is not a natural skill. Hunters must know the capabilities of their rifles, the intricacies of their scopes, the characteristics of their ammunition, the distance of their targets and their own competence for setting up for a fast shot at an animal. "Shooting is a perishable skill. If you haven't done it in awhile, you're going to get rusty," says Rick Basagoitia, area wildlife manager in the San Luis Valley. "There are people who believe they can go out, buy an expensive rifle and without any practice start shooting like the guys on the hunting shows on TV. Well, they can't." The importance of good shooting also goes beyond just being able to harvest an animal. Developing shooting skills must be viewed as an ethical consideration by hunters. "We don't want animals to suffer. Preferably, hunters will get the job done with one shot," Basagoitia said. Shooting lots of rounds is the only way to become proficient with your rifle, explained Brian Bechaver, a district wildlife manager in the San Luis Valley and a certified firearms instructor who has hunted all his life. But to become proficient, hunters must get out of their comfort zones at the shooting range. "Most people can shoot off a bench and when they know the range of the target," Bechaver said. "But a lot of things go out the window when you're in the field and you see an animal." A hunter must quickly estimate distance, take a shooting position that might be awkward and be forced to shoot uphill or downhill. Various environmental and physical factors also affect shooting ability - heat, cold, wind, fatigue and the heart-pounding influence of adrenalin coursing through the body. Bechaver recommends forcing yourself to practice in uncertain conditions. Shoot from the prone position, shoot sitting down using your knee for a rest, use a pack as a support, estimate distances then check with a range finder, etc. "It's easy to hit a target at the range, but it's something else when you're standing in the snow on a cold day and your breathing hard and the wind's blowing," Bechaver said. Zeroing in As you prepare for this year's big game seasons, give your rifle a thorough check. Be sure the scope is attached to the barrel with the proper amount of torque. A loose scope that is not properly aligned with the barrel will cause you to miss the target. For the right amount of torque, check the manufacturer's specifications or take the rifle to a gunsmith. Likewise, make sure the stock is fastened tightly. A loose stock can alter how a bullet comes out of the barrel of a gun. Ballistics is a general term that refers to how a gun fires, the characteristics of the bullet in flight and what happens when the projectile hits the target. Volumes have been written about ballistics: how a bullet behaves according to its weight, the powder load, the caliber of the rifle, distance traveled and killing power. Hundreds of web sites offer various explanations of the technical details. Read those if you have an interest in becoming a ballistics geek. Your time is better spent, however, practicing with your rifle. There are two basic ballistics concepts that are helpful to understand: 1) As soon as the bullet leaves the barrel it begins to drop; 2) point-blank range is the distance at which a target can be hit without having to adjust the sights, scope or point of aim. The range depends on the characteristics of the firearm and the bullet. So before going to the shooting range, look up specifications for your rifle and the type of cartridge you're using. A 300 yard point-blank range is standard for most big game hunting rifles. The target you practice on should be the size of the vital organ area of the animal you are hunting: a circle of about 15 inches in diameter inches for an elk, and about 10 inches in diameter for a deer. The vital area is just behind and slightly below the front quarter of a big game animal. A shot placed in this area will tear through the heart and lungs and kill an animal quickly. At the range, Basagoitia suggests that hunters practice from the prone position, either resting the rifle on shooting sticks or on a backpack. "I don't advocate shooting off benches. Benches are for bench-rest shooting, not hunting. People should do all their practice in situations they are likely to use in the field," Basagoitia said. To get a feel for your rifle - or to refresh your muscle memory - start by shooting at the middle of the target at 100 yards. Because the scope is mounted over the barrel, when you look at the target through the scope the barrel will actually be pointed up slightly. Consequently, if the point-blank range of your rifle/cartridge combination is 300 yards, and you're shooting at a target 100 yards away, the bullet should hit about 3.5 inches high on the target - but still within the vital target zone. Take as many shots as needed to obtain a two-inch grouping with five bullets at that distance. At this distance it's OK to use cheap ammo. Scopes have different types of adjustments, so be sure to know how yours works. 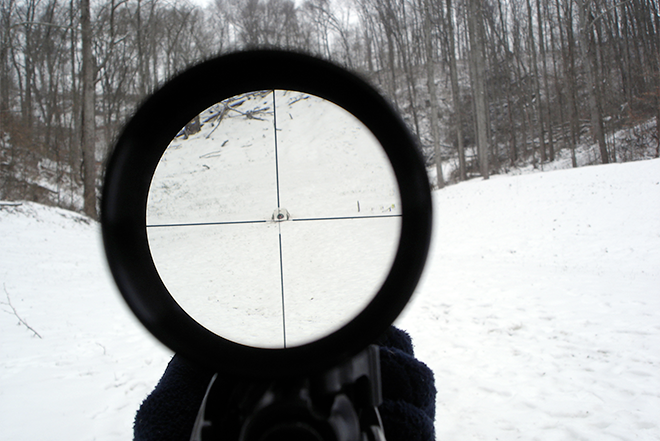 Many scopes provide for adjustments of one-quarter inch at 100 yards. So at 100 yards the shot should be 3.5 inches above the middle of the target if your scope is correctly set. But if your shot, for example, is two inches above that, you need to adjust the scope. If it adjusts in one-quarter inch increments, you need to adjust the scope by eight one-quarter inch turns - or clicks - in the down direction. Thus: 8 x 1/4 = 2 inches. The same goes to make adjustments to raise the shot or to go to the right or the left. Next, set the target at 300 yards - or at the prescribed point-blank range - and use the bullets you'll use when hunting. Even though the rifle is capable of accuracy at that distance, 300 yards is a very long shot and will truly test your ability. 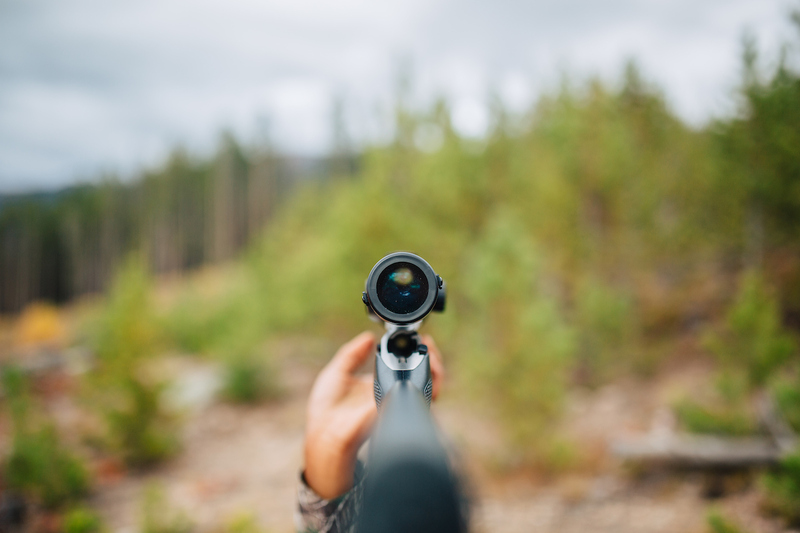 You'll be feeling the effects of recoil from previous shots, and you'll find that holding the rifle steady on a target at that distance is challenging. This situation provides a good simulation of conditions in the field. You should shoot until you can get a good pattern in the target with five shots. "You can get lucky with three shots," Basagoitia said. "But you can't get lucky with five shots at that distance." At 300 yards or more the bullet pattern will probably be larger than what you shot at 100 yards. The critical factor, however, is landing all the shots in the vital area. Determining distance to a target is also an important skill to hone. "Estimating range is huge," Basagoitia said. "Most people consistently underestimate distances." He recommends getting a range finder and practicing with it at various distances in the field. When hunting you probably won't have time pull out the range finder, but with practice you can develop the skill to estimate distance. Because of the potential for animals to be wounded, wildlife officers recommend against long shots. Bechaver won't take a shot if the animal is more than 300 yards away. "That's my maximum distance, but that's still a very long shot. I must be in the prone position and feel very comfortable and calm. Not many people can make a 300-yard shot," he said. Going beyond the maximum point-blank range requires adjusting your aim, something that Basagoitia doesn't recommend. "That takes even more practice," he said. "Realistically in Colorado, most shots will be well under 300 yards. It's best to spend your time practicing at distances that are practical, from 100 to 200 yards." When shooting at a distance of 100 yards or more, be aware that wind also becomes a significant factor. If possible, go to the range when there is little wind -- mornings are a good bet. If you are hunting on a windy day, you can minimize the effects by getting directly upwind or downwind of your target. "Wind is a major factor and most hunters don't even think about it," Basagoitia said. "If the wind is strong enough to make the smaller branches on a tree move, then restrict shots to no more than 200 yards." A key component of good shooting is trigger control. Place only the pad of your index finger on the trigger, squeeze slowly and continue to squeeze after bullet is fired. Continuing to squeeze provides "follow through" and contributes to a steady position. Don't pull the trigger quickly because that will cause the gun to move off the target. "It's a good idea to dry-fire your rifle, it's one of the best things you can do to practice holding your gun steady while squeezing the trigger," Basagoitia said. "As you squeeze the trigger, pay attention to the position of the scope cross-hairs and see if they move." After you feel good about hitting the targets from various distances, attempt more realistic shooting situations. Shoot sitting down, leaning against a pole or tree or resting on a rock. Walk quickly for 20-30 yards, then drop, calm down by taking some slow breaths and then try to hit the target. If possible, shoot uphill and downhill. Hunters should buy shooting sticks, a simple bi-pod that attaches to the barrel of a rifle. Without those, practice using your pack as a rest from the prone position. The more you shoot, the more confident you'll be in the field. "When you're hunting you don't want to think too much about what you have to do. By shooting a lot, you'll reach that point called unconscious competence. That's when you're able to do things automatically," Basagoitia said. And after you've taken lots of practice, you should be able to confidently answer the question "Do I know how to shoot straight?"